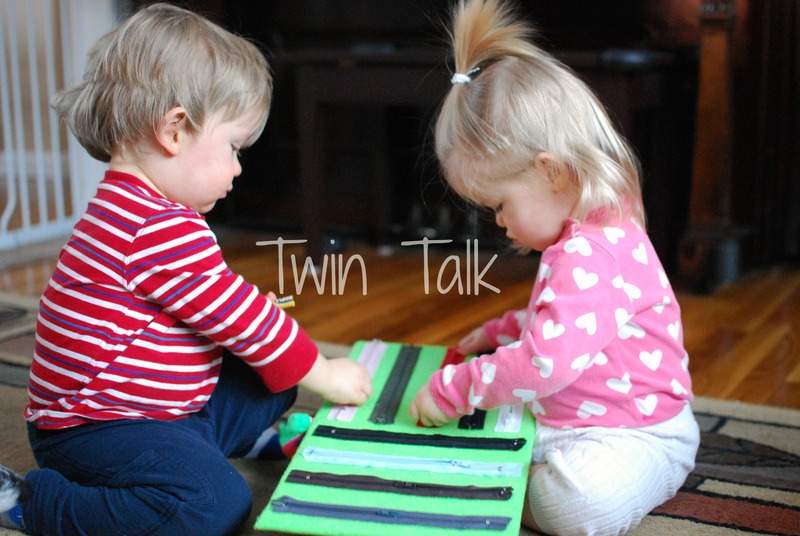 A few months ago my twins took an interest to buckles. It started in their high chairs and spread to the car seat. They couldn’t do anything with them, but they liked when we discussed buckles and clearly there was a fascination there. I went online and tried to see what I could make with buckles, and ended up making a buckle pillow (post to come in a few days). But then, the twins started in on zippers. 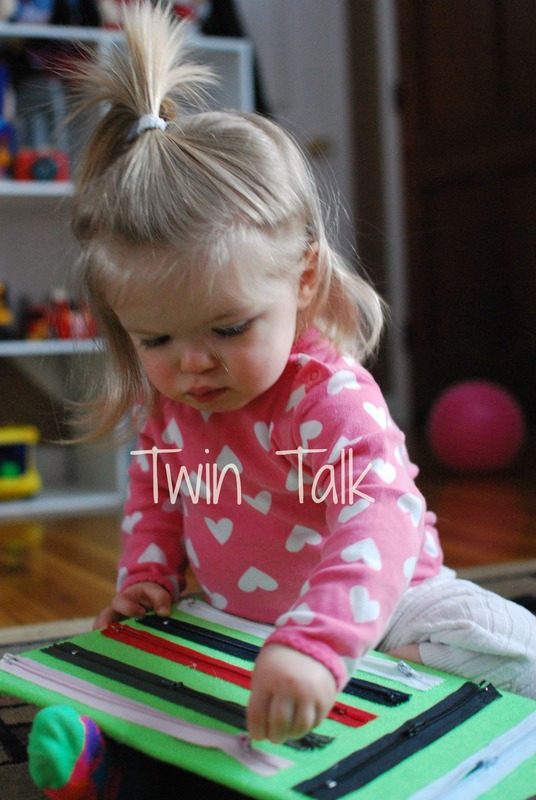 They loved to pull down my fleece coat’s zipper and we would say, “Down…Up!” and repeat. 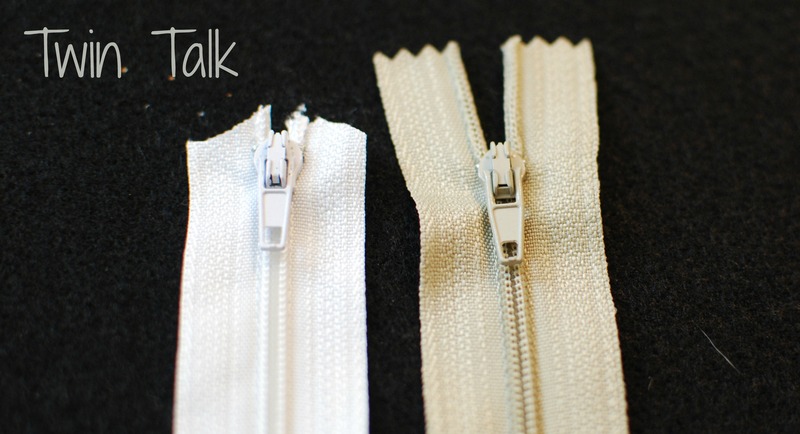 So I got back on the computer and struggled to find a lot on what I could do with zippers until I came across this post. I knew making a zipper board was exactly what I would do. I actually made two. It was unbelievably cheap, simple, and best of all – quick to make. 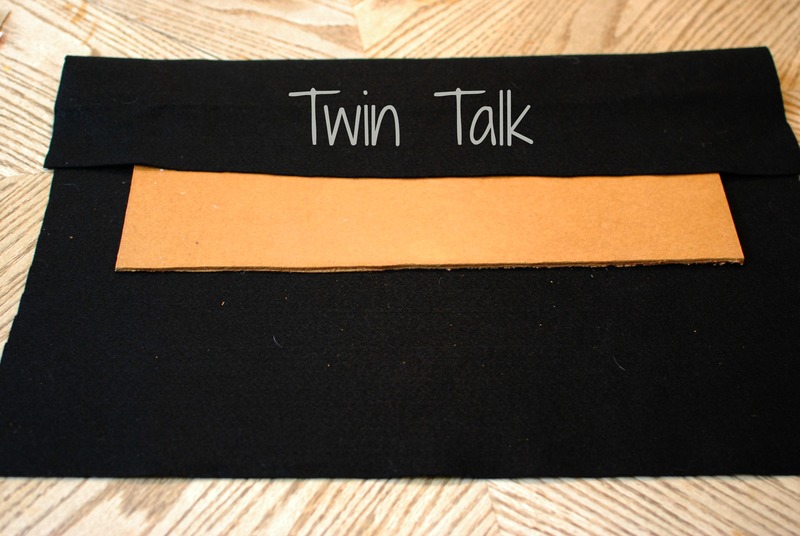 I could make one zipper board in about one hour’s time. So fast! Edited: This post contains affiliate links, which means if you make a purchase using these links, I will make a percentage of the profit. Here’s what I did: I had some old, thin board in the basement – the kind that goes in the back of pieces of cheap furniture. It was a large piece and my husband helped me cut it down into four pieces. Each piece ended up being about 17in. X 9 in. I also had leftover neon green and black felt from B’s Frankenstein Halloween costume. Not the prettiest colors, but I’m all about cheap here. I also already had a hot glue gun (but you can find one for cheap HERE). 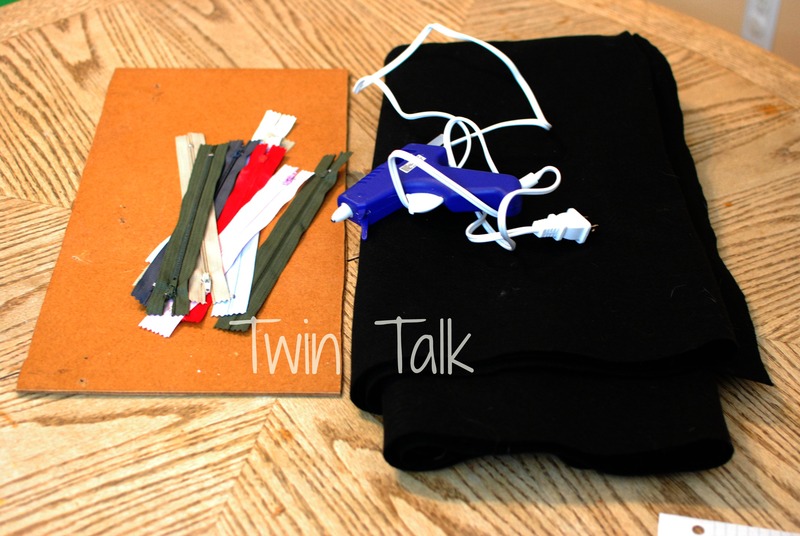 Knowing I was going to make these for the twins, I purchased zippers ahead of time. I got craft zippers very similar to this set. Again, the colors weren’t my favorite, but they were super cheap. Each zipper board cost me under $5, and as I said, one hour of my time. After I gathered my materials, I spread out the felt and put the board in the middle, exactly like how I would wrap a present. I started in on the top flap, folding it over and hot gluing it little by little, every inch or so until the entire top flap of felt was stuck to the board. Let me say here that I only used real wood and felt because I wanted it to last a while. If I didn’t have these materials or preferred, I could’ve just grabbed some cardboard and glued the zippers on them right away and this project would’ve been done in 10 minutes! 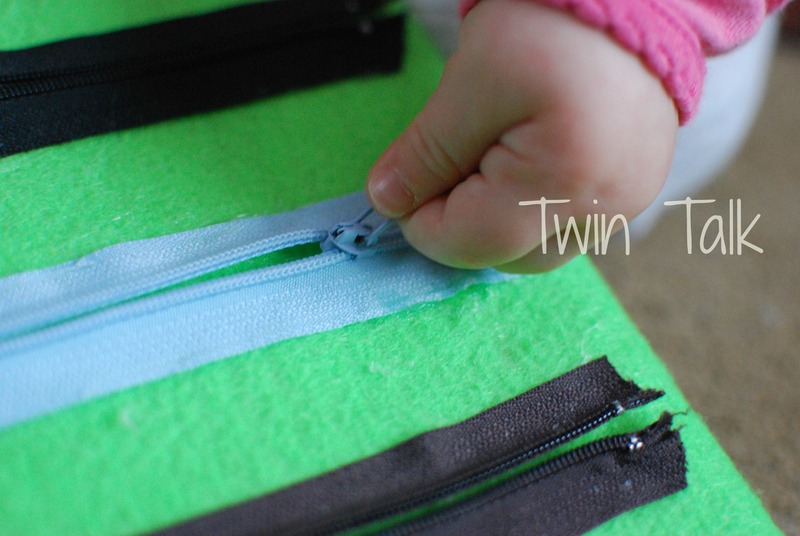 At this point I grabbed my zippers and at the top of each one, I cut the tips off diagonally, so that the zipper would move more easily with toddler fingers. 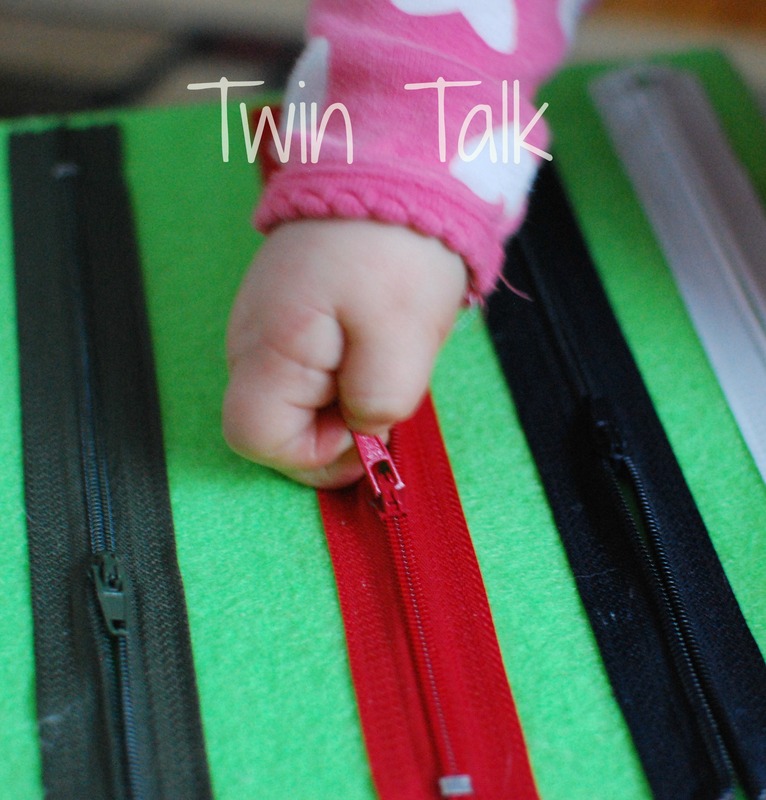 If I kept the tips on, the twins would’ve gotten frustrated that they were pulling on the zippers and they weren’t going any higher (they have the metal piece on the inside stopping the zipper at a certain point – if yours didn’t, you could just add a staple). Here’s what I mean. 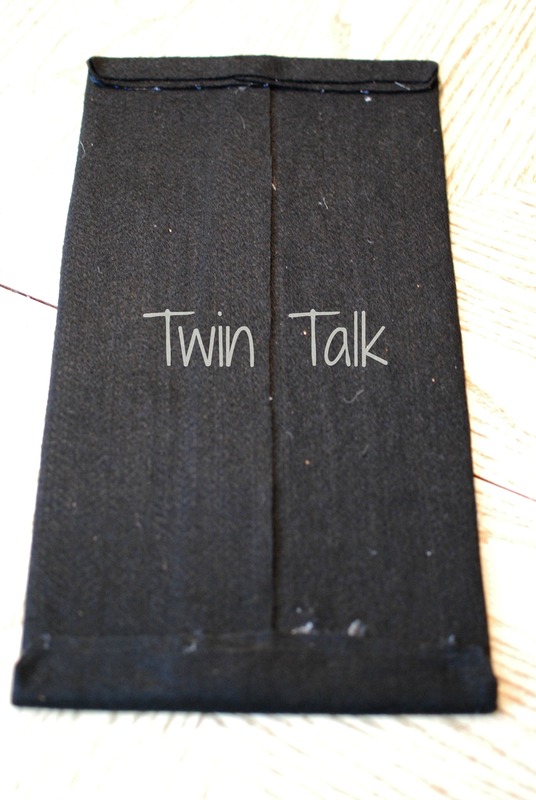 I wasn’t sure how the twins would take to the boards, because the zippers are really small and hard to grasp. I had hoped for larger zippers but that didn’t happen. Sure enough, C grabbed the board today and got right to it. She was focused, concentrating hard, and surprisingly had very little trouble zipping! 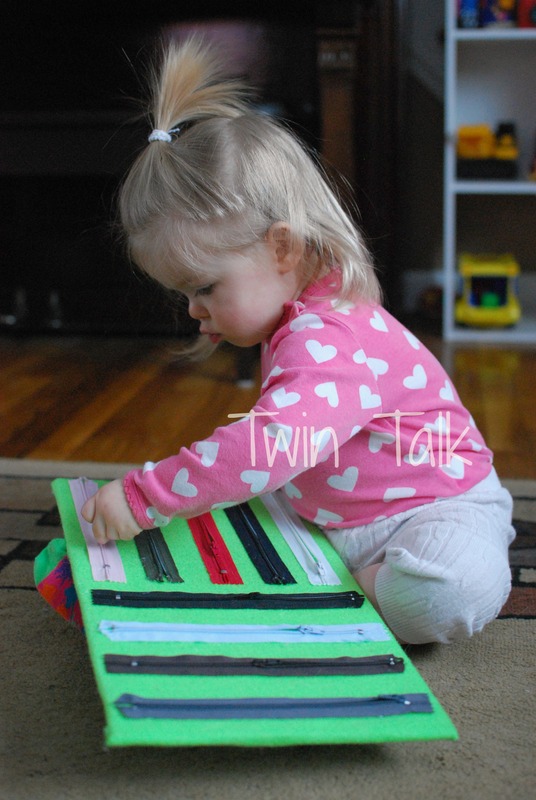 This activity is so awesome for those fine motor skills, which is so much of what our activities are lately. C was able to grasp the zippers easily and pull back and forth for a long time! She tried switching her position many times, as the board was pretty big. Then B went on his merry way and C got right back to it. This was the first activity we have done where she was more into it than B. Given that I spent practically nothing on making these boards and it only took an hour for each one – I’d say it was worth it. Now that I think about it, it would be a great car ride activity! That looks like fun! I’m a little scared of hot glue guns but I guess I need to get over that. Do you think a small purse would work too? I bet I have an old one they can play with, or find one at the consignment sale I’m going to this afternoon. Haha I do burn myself on those glue guns constantly. They’re such a pain but I love them! Yes a small purse would be great! 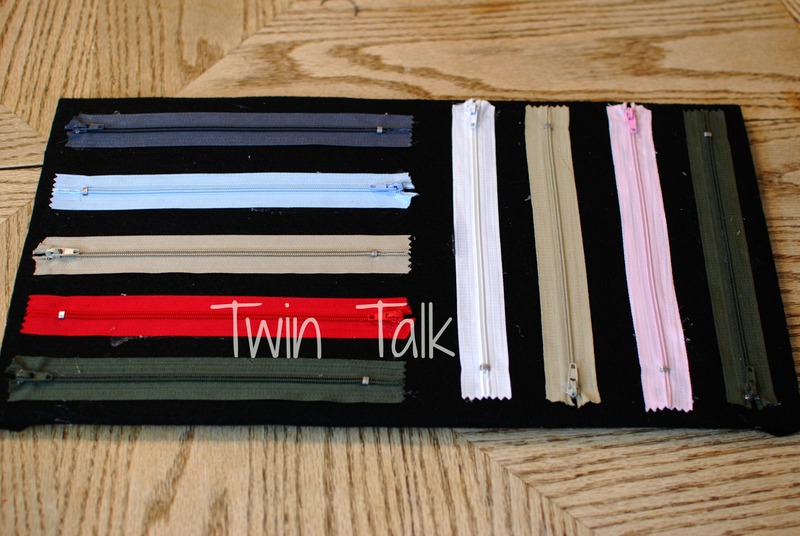 You don’t have to make a board – anything with zippers! Well thank YOU so much! Wouldn’t have done it without you! Love this! I will definitely be making one before our next road trip. Thank you! It’s perfect for a road trip!! So do the zippers come off? That’s the part that confuses me. I have two little boys that I think would love this! Hi! Nope, the zippers don’t come off. I superglued them to the board and they’re stuck super tight! Just be sure to glue the edges of the zipper and not the middle, otherwise you won’t be able to zip and unzip it! I love the simplicity of the board. You’ve inspired me to make one for my toddler now!